After a free weekend in which we all obediently studied and contemplated the course, we reconvened Monday morning to get back into the swing of things. We all formed up at the Supreme Court at 10am and, stripped of our protective pepper sprays, penknives, and shotguns, investigated the new “Highest Court in the Land.” We had a tour of the three Court Rooms, and we learnt about the Constitutional Reform Act 2005, where they introduced this new system. 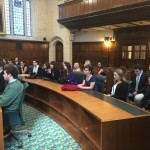 We were impressed by the relative informality of the Supreme Court, where Judges all sit on the same level as the barristers and all cases are live streamed. Some of us took the inevitable selfies in the Judges’ Chairs. One of the Court Rooms is where the Privy Council sits, which still hears cases from various Commonwealth countries: mostly minor islands, although it included international heavyweights like the British Antarctic Dependency. We got to sit in on a Directions hearing and it was educational to see the Court process and a QC actually in action. There was also a small exhibition downstairs, which had an interesting history of the development of the separation of powers and the higher Courts in the UK. 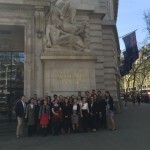 After a lunch break, we returned to Australian territory by going to Australia House on the Strand. The Harry Potter fans amongst us were excited to be going to the setting of Gringott’s Bank! We started with some delightful refreshments, thoughtfully provided by the Australian Taxpayer, before we sat down for a presentation by High Commissioner Alexander Downer. His Excellency the High Commissioner shared his insight on the history of the building, the Australia-Britain relationship and the likely consequences of the upcoming UK election on that relationship. The High Commission building itself was the first major public work undertaken by the new Federal Government after Federation, and was built of marble and timber imported from Australia during the First World War. 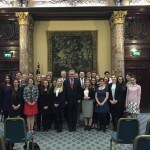 The speech was refreshingly candid and covered a number of side topics, including the likely impact of the Scottish Independence movement and Britain’s relationship with Europe. In the late afternoon we were invited to Baker & McKenzie, where we enjoyed the full corporate experience (complimentary food and alcohol included) in the boardroom of the world’s second largest law firm. We were addressed by Ben D. Allgrove, a very impressive Adelaide University Alumni, Rhodes Scholar and now Copyright Partner in that firm. Two of his assistant lawyers also spoke at different times. It was an honest presentation in which they shared their insight into the life of a lawyer and partner in a big corporate firm. The information was particularly interesting to the law students in the room, as it showed us the possibilities of what we as lawyers could achieve with motivation and effort in any sphere, not just a corporate one. They gave insight into contemporary hiring trends, good interview techniques, and the kind of lifestyle we could expect in a big firm. He also talked about the trends we can expect to see in the law in the near future. In conclusion, it was a jam-packed day but we were left feeling engaged and inspired by our various presentations and experiences. All those who spoke to us were pleased to answer questions and we had very useful interactive sessions in which we could satisfy our curiosity. We had all learnt a lot, and gained further insight into some of the overall themes of the Course. 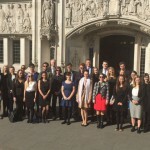 This entry was posted in Events, News and tagged Politics & Law, UK Study Tour 2015. Bookmark the permalink.